Mount Athos located in the northern part of Greece is a holy place of Greek Orthodox Church which is also called a religiously independent country. This place is also registered as a World Heritage Site. People sometimes call this mountain Holy Mountain. According to the theory, it is said that when the Virgin Mary encountered a storm in the middle of a journey, she ran away to Athos. There are 20 monasteries in Athos and the custom of forbidding women from entering monasteries has been still enforced since ancient times. The first monastery was built in this place in 963. And also places isolated from the secular world are suitable for meditation. Thereafter, many monasteries had been built from the 10th to the 11th century. The monastery regarded as the most venerable among them is called the Monastery of Great Lavra. This is the original monastery which later influenced the construction of the monastery in Meteora, etc. It is the trifoliate shape, and the cathedral is located in the center. And also, while most of 20 monasteries are Greek Orthodox Church monasteries, some are Serbian Orthodox Church monasteries and Bulgarian Orthodox Church monasteries. 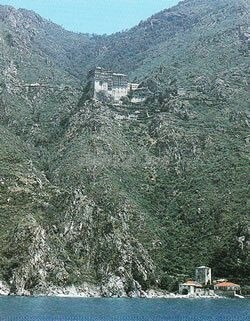 Unfortunately, women are prohibited from visiting Mount Athos. It seems that men are able to stay for a few days following the designated procedures.